Spencer: I was a little know-it-all as a kid. One of my earliest memories is interrupting a lecturer on a field trip to a planetarium to correct him about outer space trivia; “well, actually” might as well have been my catchphrase in elementary school. Even as an adult with decidedly screwed-up self esteem, I still occasionally find myself falling prey to the snare of overconfidence; in many ways, I think it’s just human nature. Supreme confidence has always been presented as one of Midnighter’s most charming attributes, but after suffering yet another loss, Midnighter 10 starts to explore whether that confidence is an asset or a hindrance, and one of the most effective ways it does so is by comparing it to the overconfidence of the rest of the cast. Our story finds Midnighter captured by the Suicide Squad; even though he continues to talk big and quickly escapes, it isn’t long before he’s defeated and captured yet again. Writer Steve Orlando seems to be establishing that Midnighter’s confidence blinds him to his own failings, and causes him to repeat the same mistakes over and over, a fact Helena Bertenelli of Spyral manages to vocalize on the issue’s very first page. By “his mistakes,” Helena is of course referring to Promethius nearly taking Midnighter down by posing as his boyfriend in issues 6 and 7. I’m sure I could write an entire article just about whether Midnighter should trust Robert the documentarist or not, but that’s pretty much beside the point here; the point is that Midnighter is repeating the same actions that already nearly led to his downfall once before. 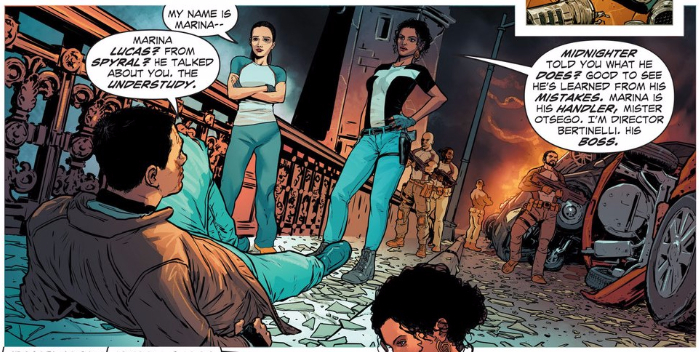 Of course, Helena, along with Amanda Waller, are both displaying some supremely developed overconfidence themselves. While Helena is clearly portrayed as the lesser of two evils in this situation (even if that makes her less interesting to Midnighter), both women are making a serious mistake by attempting to use Midnighter as a pawn for their organization. As Robert points out, there’s nothing Midnighter hates more than being manipulated, but even beyond that, neither character is savvy enough to pull it off. Jeez Amanda, follow your own advice — if she just would’ve shot Midnighter instead of talking about it, she’d have won, but instead, of course, Midnighter escapes in the very next panel. That’s a problem I’ve always had with Waller as a character (in the New 52, at least) — her plans always fail or are rendered useless yet she never seems fazed by it, meaning that she comes across less as the manipulative, line-walking mastermind she’s meant to be and more as an arrogant, ineffective idiot completely lacking self awareness. 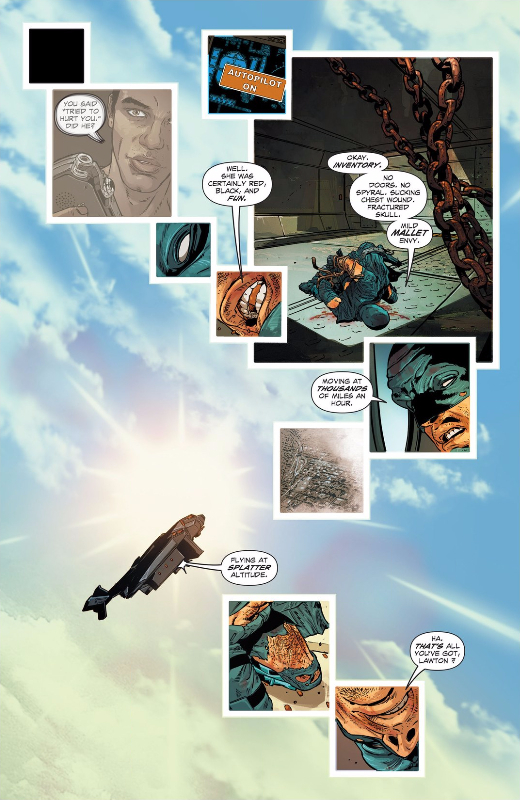 Her confidence simply isn’t founded, and that’s probably why it’s so easy to root for Midnighter throughout their confrontation even though Midnighter’s just as smug (besides an establishing shot, the first panel of this scene is a close-up of his smirk, establishing his confidence as the key emotion of the scene). This also applies to Midnighter’s battle with Deadshot. I’ll admit, Deadshot’s mouthing off to the captured Midnighter and his concern about being Waller’s B-Team rings false to me — that’s not the suave, disinterested-in-everything Floyd Lawton I know and love — but I can better grasp Floyd’s breakdown after being defeated. 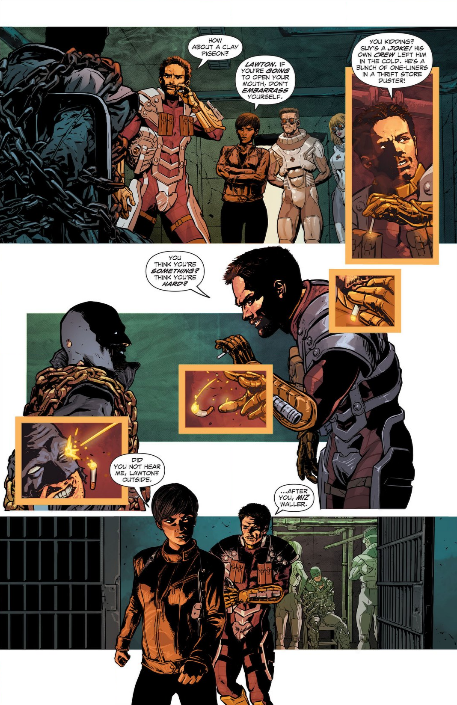 Unlike Waller, Deadshot has a reason to be arrogant — he’s the best shot in the world, and even Midnighter has to take a slug to the chest in order to get close enough to finish him off — so being not only defeated, but crippled has to be humiliating. 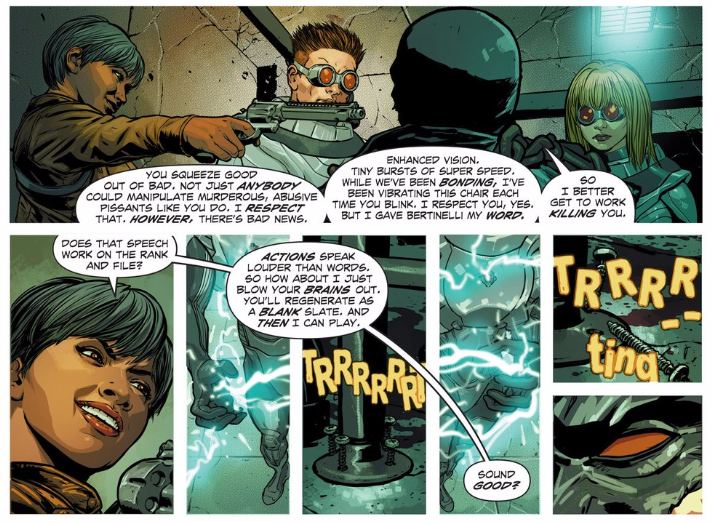 Of course, immediately after defeating Deadshot Midnighter himself falls at the hands of the Parasite and Harley Quinn. So what does all this mean? Is it a lesson in tempering our confidence? Deadshot has every right to think he’ll win most confrontations, but should realize when he’s as thoroughly outclassed as he is against Midnighter? And, again, maybe Midnighter should be more open to the possibility of losing, as he’s been defeated three times almost back-to-back now? Even when he’s clearly losing, Midnighter still doubles-down on the trash talk — I guess the question would be, is his confidence earned, or has it transformed into harmful overconfidence? I doubt we’ll be able to to properly answer that question until this arc concludes, but in the meantime, an interesting clue comes once Midnighter wakes up. Midnighter’s smack talk usually seems like it’s meant to unnerve his opponents, but here we see him talk big even when he’s by himself. I’m starting to think that much of Midnighter’s success relies on him convincing himself that he can win, perhaps even moreso than on his beloved fight computer. The flashback to Robert here also reminds us of the pain Promethius’ betrayal may have caused, painting Midnighter’s smug confidence as perhaps a kind of coping mechanism for everything he’s been through. So while Midnighter’s confidence may sometimes be unfounded or even harmful, it seems like it may be necessary in order for Midnighter to operate at his peak potential — or perhaps even to keep on operating at all. Maybe the question we should be asking, then, is if there’s a better way for Midnighter to do things, one that doesn’t involve leaving himself open to threats. Hugo Petrus and ACO are credited on art for ten pages apiece in this issue, but I’m wondering if that’s a misprint — if not, then Petrus is doing an absolutely dynamite ACO impression, because their two sections are practically identical. Needless to say, Petrus and ACO bring the same dynamic, intuitive storytelling to this issue as they have their previous entries — there are several scenes in particular I’d love to discuss, but I’m just plain out of space. Mark, can you pick up my slack in that department? And obviously, I’m eager to hear what you thought about the rest of the issue, as well. Have at it! So, yes, Petrus is obviously very capable of a reasonable enough facsimile that the change between artists is smooth enough that it could easily go unnoticed. But I also don’t think there’s any question that ACO is more comfortable — and, frankly, just better — with this level of complexity. Less exciting is the continued time spent on Robert the documentarian, since I still don’t fully understand why Midnighter is open and trusting so soon after being brutally betrayed by his last boyfriend (aka Prometheus, aka Dude Who Long-Conned and Stabbed Him). His existence feels especially superfluous knowing that — sigh — Midnighter is cancelled come June. Maybe this is all leading up to a happy ending of sorts for our favorite badass? Speaking of repeating past mistakes, another potential one who gets lip service (but never seen) this issue is our new friend Afterthought. I’ll admit, just like Robert doesn’t make a ton of sense to me at this point in the narrative, Afterthought — the one man who can out-Midnighter Midnighter — doesn’t make much sense to me either. Why have another big bad who is in many ways the non-sneaky version of Prometheus? It all feels a little redundant at this point. I’m grateful that after a couple issues of build-up we finally get to see Midnighter really take on the Suicide Squad. Any previous complaints I had about the Squad making an appearance purely to boost sales are moot, since it turns out it’s inherently fun to see Midnighter bouncing off other big personalities like Harley Quinn. 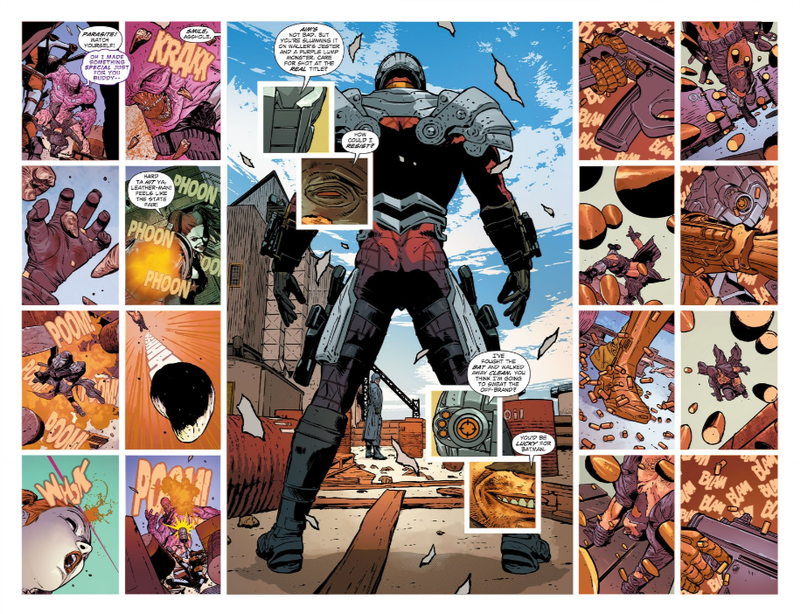 With the help of Petrus and ACO, it’s never not cool having Midnighter outsmart and outmaneuver his opponents, even to the brutal extreme of taking a bullet in order to position himself best for an attack. But that’s how Midnighter operates. Can he change his approach like you suggested, Spencer? As an omniscient reader, we know that a person with Midnighter’s abilities who isn’t brash and ambivalent to danger is just Batman, and DC already has one of those. But with Orlando’s Midnighter sadly coming to a close, and the character’s future in Rebirth unknown, maybe it’s not so impossible in the short term.